Teetering on the Edge? ~ Don't be! 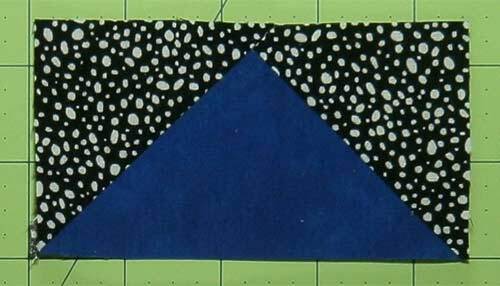 Learn how to make a Seesaw quilt block using one of two different techniques—paperpiecing or connector corners—in three different sizes. Connector corners is a simple technique that creates half square triangle (HST) shapes without cutting a triangle...no bias beast to tame. 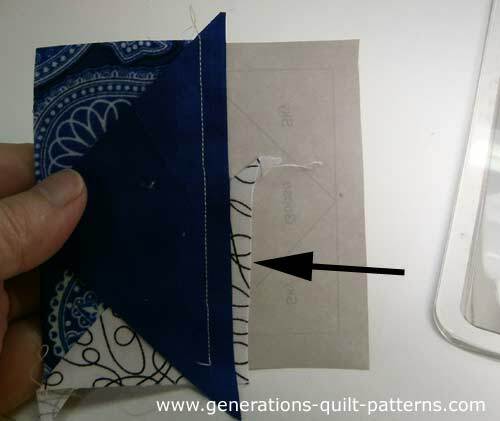 And with the paper piecing method, you'll learn how to amend a pre-printed pattern so that you get more use out of the original design. When instructed to press, first press the pieced unit flat to set the seam. Then open the patch, pressing from the front. If you choose to paperpiece, you may want to reduce or eliminate the use of steam for pressing these blocks. Steam tends to curl the paper. 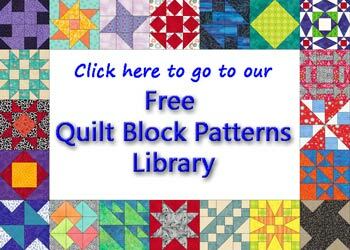 Click here to review our 'primo' method for the flattest quilt blocks you'll ever see. It works even with the paper attached. It's so simple to do, you'll wonder why you didn't do it sooner. 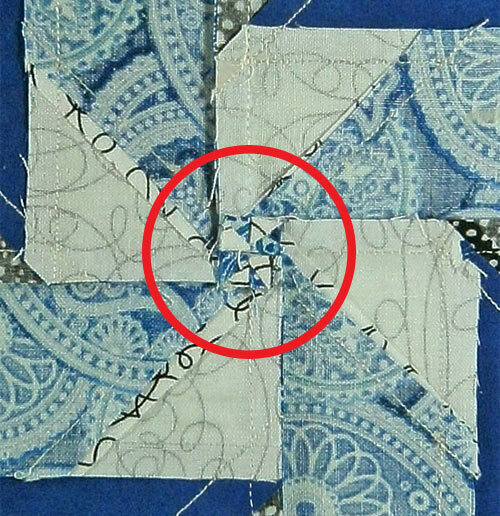 Paperpiecing patches are cut generously so that placing them correctly is easy the first time. No ripping! 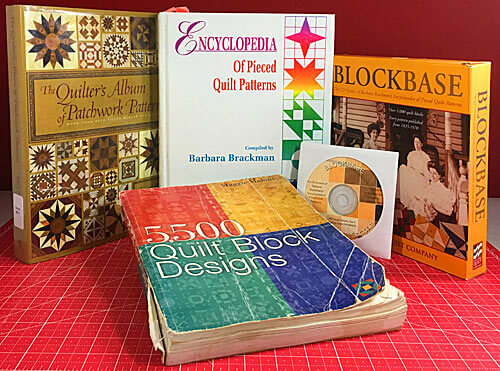 Within the paperpiecing chart, are the links to the free pattern download needed to make the block (the row is highlighted in yellow). We'll be using the Jack in the Box unit and making a slight change to it. These are the charts for the two different methods. Choose one and cut all the patches listed. **Print two pages of the 4" unit. Patches used in connector corners are cut the exact size. 1	 A	 4	 1½"	x	2½"	 2"	x	3½"	 2½"	x	4½"
2	 B	 4	 1½"	x	1½"	 2"	x	2"	 2½"	x	2½"
Goose	 C	 4	 1½"	x	2½"	 2"	x	3½"	 2½"	x	4½"
Sky	 D	 8	 1½"	x	1½"	 2"	x	2"	 2½"	x	2½"
Unfinished Jack in the Box unit	 2½"	 3½"	 4½"
Unfinished Block Size	 4½"	 6½"	 8½"
Grid Size	 1"	 1½"	 2"
Click here to skip down to the Connector Corners Technique. 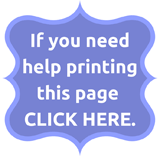 Cut out the four units from the page(s) you downloaded. Just outside the dashed line is good, there's no reason to spend any time being exactly on the line. 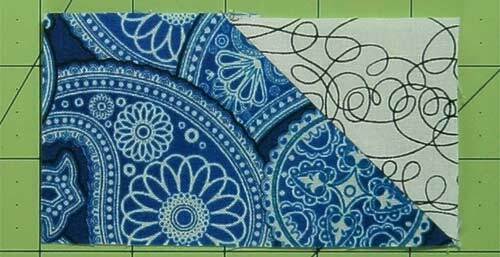 If you look closely, you'll see that there is an extra stitching line on this pattern that doesn't appear in the Seesaw quilt block design above. We're going to take care of that right now. Do it for all four blocks. That's all there is to modifying the pattern. It might look backwards—like we marked the wrong side—and there's a reason for that. We are stitching from the back of this asymmetrical unit. 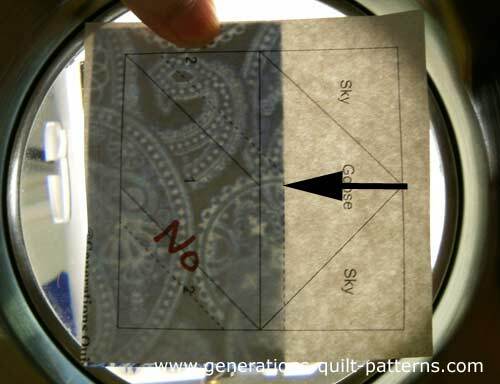 With RST, align a #2 with #1, you should be able to see it shadow through the paper to help put it in place. Do not use the stitching line for a second #2 that we marked with the red 'NO'. We just don't need it for this design. 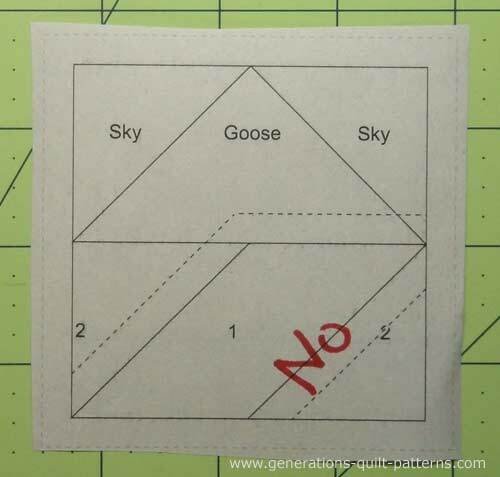 With RST, align the long edge of a goose with the previously sewn patches. Again, use the placement line (arrow) to position it properly. Trim away any extra SA over a 1/4". I use a scissor and eyeball it, it's faster and accurate enough. Press and add the sky triangles in the same manner as the #2s. Stitching, pressing and trimming for each. Repeat the process for the 3 remaining units. For more detailed instructions on using connector corners, click here. 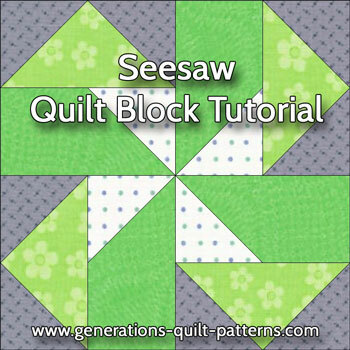 Hit the 'Back' button on your browser to return here to the Seesaw quilt block page. Mark a diagonal line with pencil on the backside of the four #2 squares. With RST align a #2 with the right hand side of a #1 rectangle. Stitch on the line. Press. 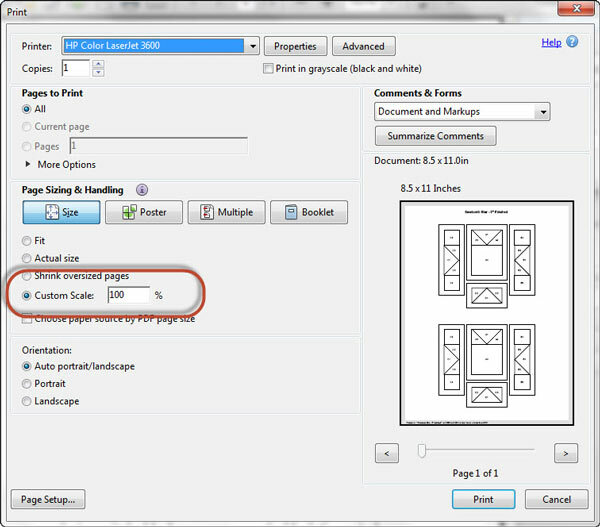 You can choose to trim the excess layer or layer(s) away to reduce bulk. Make four units that look like this. Mark a diagonal line on the backs of the eight sky squares. 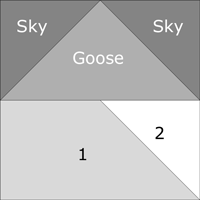 With RST, align a sky patch with a goose rectangle. The line bisects the lower right corner and the center top. 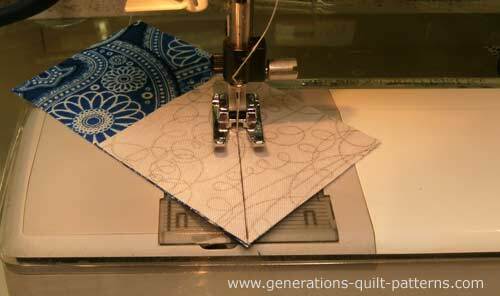 Stitch, press and trim to reduce bulk. Repeat for the left hand side. Stitch four units that look like this. 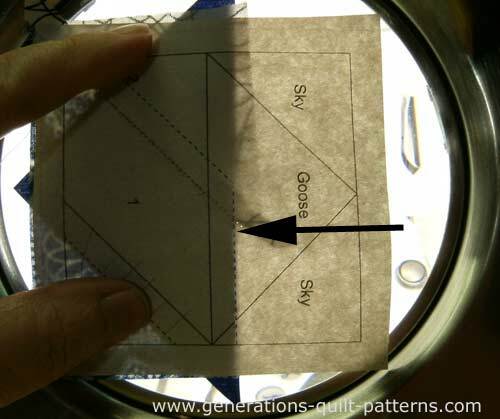 With RST and a 1/4" seam allowance, stitch the bottom of the goose unit to the top of the pieced rectangle. Make 4 of these units. 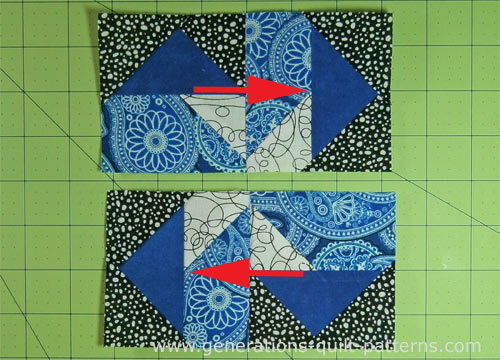 Lay out the patches into rows to create the Seesaw design. The units are rotated a quarter turn as you move clockwise around it. 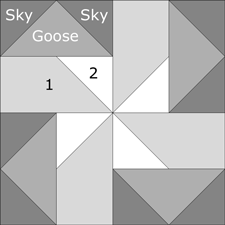 Each goose points to the outside edge. Press, with SAs in the direction of the arrows or towards #1. And finally sew the rows together. 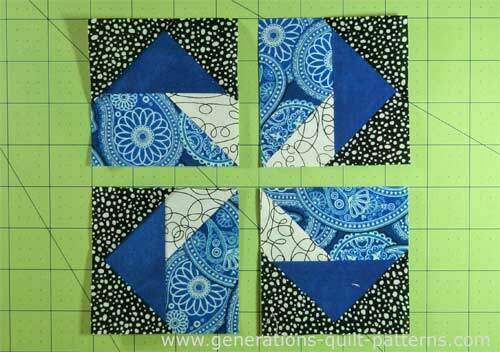 This is the finished Seesaw quilt block. 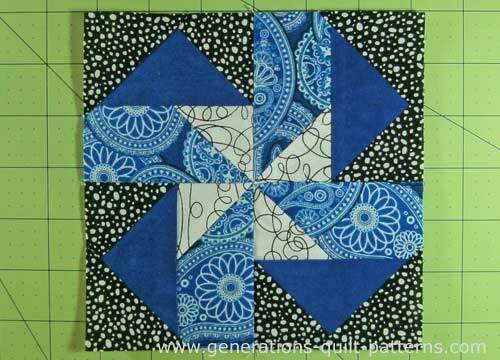 I like to twirl the SAs to reduce bulk in the center of the block (it forms a cute little pinwheel on the back). Here, all the SAs that joined the units together are pressed counterclockwise here to do that. 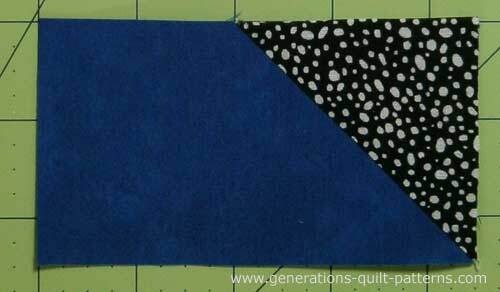 You can also see where I've graded SAs so that the darker fabric doesn't shadow through to the front of the block. That trimming was done with scissors during construction. Totter over for more blocks to make!